Prosecutor Mueller appears to have outwitted the Donald. Now there’s a major surprise. We are, still, talking about “process crimes,” as Senator Lindsey Graham described them. Graham knows all about the consequences of “process crimes,” though. He was one of the “prosecutors” from the House of Representatives who argued impeachment charges against President Bill Clinton based on a lot of similarly sordid stuff back in 1999. Well, “Russiagate” has its own John Dean – rather, Bubblevision’s politics outlets are framing Michael Cohen that way. That’s even as the real John Dean is right there, on screen to relate his experience in Imperial Washington’s combat kabuki to what’s happening now. Meanwhile, the Tweeter-in-Chief is in Buenos Aires for the G20 summit. The great hope is that a scheduled meeting with Xi Jinping will result in a breakthrough sufficient to stop tariff escalation and prevent total trade war with China. We can add this to the Donald’s and Wall Street’s great hope for a retreat from “normalization” by Federal Reserve Chairman Jerome Powell. The Christmas Eve Tax Cut of 2017 was a fiscal, economic, and political monstrosity. It’s the worst tax bill enacted since FDR’s soak-the-rich scheme in 1937 reignited the Great Depression. It is true that, this time around, rather than soak America’s wealthy, the GOP’s bill pleasured its primary constituency with tax relief. 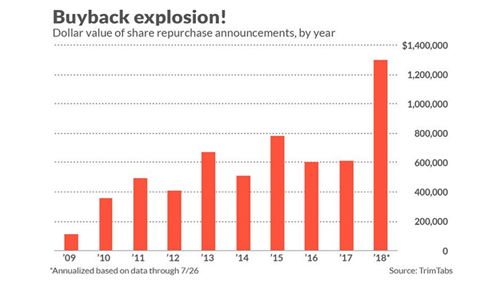 Owners of public equities, for example, bathed in an estimated $1.3 trillion shower of stock buybacks. That’s fueled by the cut in the corporate rate to 21%. They enjoyed massive dividend increases too. And there’s no MAGA about it. Four million top-bracket “alternative minimum tax” payers were relieved of about $80 billion per year of Uncle Sam’s extractions. Around 5,000 dead people per year, with estates above $20 million will get to leave more behind to their heirs. Owners of real estate will be able to deduct another 20% of property income that isn’t already sheltered by depreciation and interest deductions. The common thread connecting FDR’s disaster and this one is that both represent exactly the wrong policy at exactly the wrong time. The Christmas Eve Tax Cut of 2017 was, at best, a coup de grace that will finally help us, ultimately, see off this era of Bubble Finance. At worst, it’ll smoother any semblance of prosperity as we’ve come to know it. The bottom line is new borrowing over the next 10 years will cause the already monumental public debt to spiral out of control. But, again, it’s a matter of timing. As far as the Fed is concerned, it’s “normalization” now, “normalization” tomorrow, “normalization” forever. That’s because the Fed is concerned with the Fed and the Fed’s power.